Oni Press announced at Emerald City Comic Con today that it is now the official publisher of Penny Arcade, a massively popular gaming webcomic that revolves around Gabe and Tycho, the alter egos of creators Mike Krahulik and Jerry Holkins. The success of the strip, which boasts four million monthly readers, has lead to spin-off video games, an online reality show, and a series of gaming conventions known as Penny Arcade Expo (PAX). "This was a no-brainer for us," said Oni Press publisher Joe Nozemack. "The guys at Penny Arcade are driven by the same rebellious desire to create that led to our starting Oni Press. We emerged from the same zeitgeist. The first Oni Press comic was published at the end of 1997, and Penny Arcade hit the web in 1998. We aren't just peers, we come from the same graduating class." "I've been a fan of Penny Arcade's irreverent take on gaming culture for a long time," said George Rohac, operations director of Oni Press. "We always read their comics in the office, and for several years, our company has been exhibiting at PAX, the gaming festival the Jerry and Mike organize with their business partners. I've always felt the two endeavors were simpatico. The same people who read Penny Arcade and play video games are likely to dig [Oni books] Scott Pilgrim and The Sixth Gun, and vice versa." Oni will release the next print edition of the webcomic, Penny Arcade, Vol. 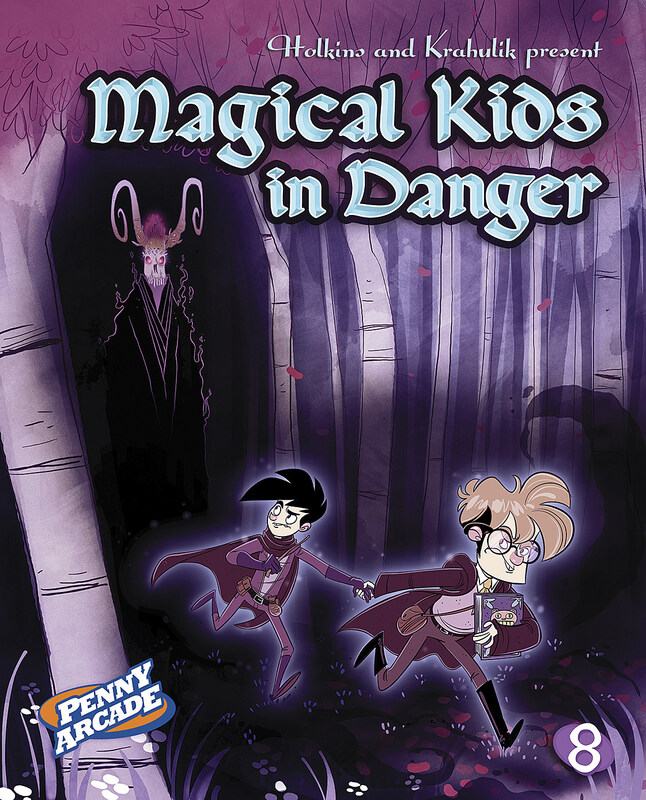 8: Magical Kids in Danger, on August 19th. The full-color book will collect all of the strips originally published online in 2007, and retail for $14.99.